Why Does Implicit Racism Score High in Some States and Not Others? 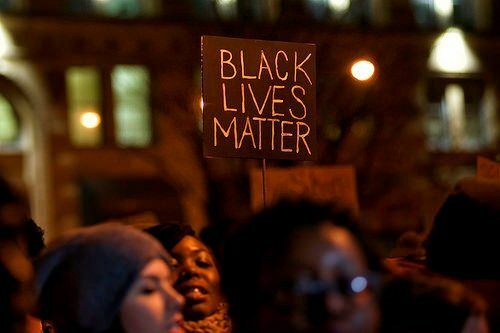 When many observers think of racism, they think of overt racism, like that of Fairview Park, Ohio auxiliary police officer Aaron McNamara, who was caught writing on Facebook pages about “jungle monkeys,” “spooks,” the mistake the U.S. made in abolishing slavery, and the need for black “people…[to] be exterminated.” But that’s the easy analysis, thinking that identifying people ranting and raving about persons of color and firing them from official positions amounts to a solution to the problem of racism. The reality is that most whites, including those in high level public and private offices, “show subtle or ‘implicit’ biases against blacks,” hidden and racist beliefs that most people would deny holding if you asked them. Project Implicit at Harvard University has given the Implicit Association Test (IAT) to 1.5 million voluntary test takers and developed a state-by-state mapping of scores. 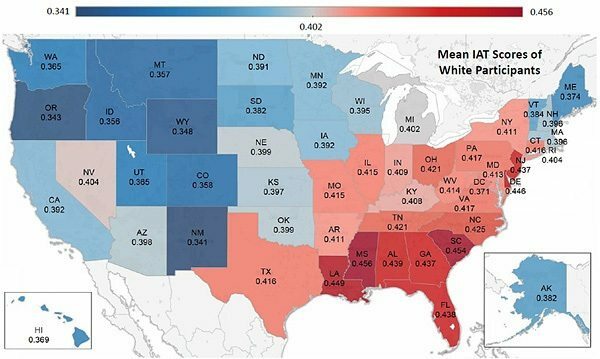 The Project Implicit map of mean IAT scores shows the highest rates of implicit bias in the Southeast, the Middle Atlantic states (except for Washington, D.C.), and some states of the Midwest (though not Wisconsin, Minnesota, and Iowa). Why those states? A psychologist at Lehigh University, Dominic Packer, has proposed a disturbing analysis. Writing for the Washington Post, Chris Mooney summarizes Packer’s theory as, “Implicit bias is higher in U.S. states in which there is a higher ratio of black citizens to white citizens—or in other words, in which there are relatively more black people for every white person.” One would think that more interracial interactions would reduce implicit bias, but the map, if Packer’s theory is correct, suggests the opposite. Packer thinks that in states with higher ratios of blacks to whites, white perceive “greater competition for political, cultural, and economic resources” or “greater risk for cross-race crime.” Therefore, states in the Northwest and New England, where the ratio of blacks to whites is lower, have the lowest mean IAT scores.